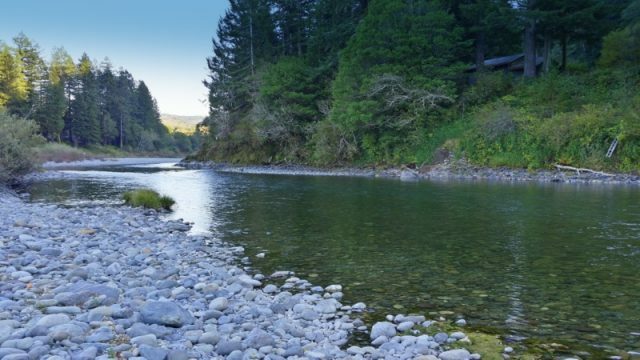 The Smith river is one last wild river left in the California and is one of the West Coast’s top salmon and steelhead destinations. It holds the California state record for steelhead, a 27-pounder, and produces many of the biggest salmon outside of Alaska, with fish in the 50- to 60-pound range caught each season. The Smith River record king is a whopping 86 pounds. The Smith is also known for its breathtaking scenery, with towering redwood trees, deep clear pools and steep rock walls. It’s not only California’s No. 1 destination for trophy salmon and steelhead, it‘s home to one of the best salmon and steelhead fisheries in the world. Salmon angling begins in September in the lower Smith, where anglers target chinook near the mouth, Entering October, salmon are stacking up in the Sand Hole, perhaps the best fishing hole in the entire lower river. Fishing the sand hole anglers troll anchovies or plug-cut herring for kings waiting for water levels to rise before moving upriver. The AM bite at the Sand Hole is one of the most exciting times of the season, powerful kings grab flashing bait being trolled in shallow water and immediately sprint after being hooked. Once the rains arrive, fishing opens above the mouth of Rowdy Creek. Big salmon are caught on plugs and eggs back-bounced through the deep pools holding fish. Salmon fishing continues well into December, when steelhead fishing begins to take the stage. The peak season November fishery is the best drift boat action for kings in California. You never know if the next strike will be a 20-pounder, 40-pounder, or one of those giant 50-plus-pound kings that are landed each and every year. The Smith river generally offers fishing opportunities year round except for conservation closures. This fishery generally allows 1 Chinook salmon or 2 hatchery steelhead per day. Top Recommendation for this location trolling plugs, drifting eggs, hardware like spinners and jigs.